Place 5 cups of cooked rice into a large container, preferably wood. Pour vinegar mixture (or sushi seasoning) over hot rice, and cut in with rice paddle instead of mixing. Cool rice to room temperature. 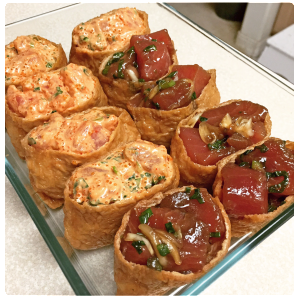 Roll a spoonful of sushi rice in palms, place in inari (about ½ full), and top with poke of choice. Repeat this step until all inari have been filled with sushi rice and poke.